Florindo Andreolli Interview with Bruce Duffie . . . . . . .
Opera Singer. A tenor with a repertoire of about 150 roles, he is remembered as one of his generations more distinguished comprimarios, the artists called upon to go onstage almost every night portraying a wide variety of characters in a multiplicity of languages. 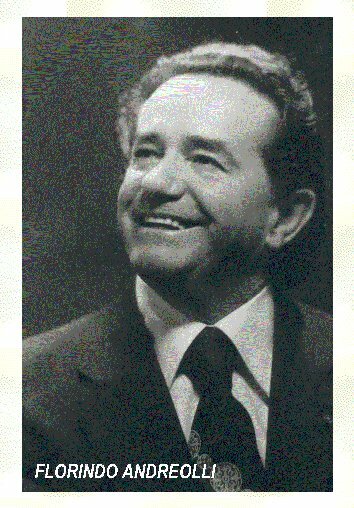 Originally trained by soprano Rosetta Pampanini, he later studied at the Conservatory of Venice with another distinguished soprano, Gilda Dalla Rizza. Andreolli made his June 6, 1948 professional bow with a recital of opera arias at the Teatro Ferrini of Adria then after winning a 1950 vocal competition was first seen on the operatic stage in January 1951 at La Finice di Venice as Gherardo from Puccini's "Gianni Schicchi". Over the years he appeared in numerous major venues, bowing in London and Paris in 1960, Lisbon in 1964, Geneva in 1965, Buenos Aires in 1967, and at New York's Metropolitan Opera in 1968, while performing at most of the major Italian theatres including La Scala Milano, the Arena di Verona, and Florence's Maggio Musicale. Andreolli's list of characters included at least three roles from Puccini's "Turandot" and four from Jacques Offenbach's "The Tales of Hoffmann", Cassio and Roderigo of Verdi's "Otello", Goro from Puccini's Madame Butterfly", the Abbe and the Incredible in Umberto Giordano's "Andrea Chenier", Remendado from Bizet's "Carmen", Beppe of Leoncavallo's "I Pagliacci", Maestro Trabucco from Verdi's "La Forza del Destino", Baron Scarpia's evil henchman Spoletta in Puccini's "Tosca", and at least one major role, the dimwitted Nemorino of Donizetti's "L'Elsir d'Amore". He occasionally sang in oratorio presentations, gave his 1994 final performances at Teatro Regio di Parma as Masil from Mussorgsky's "Boris Godunov", never officially retired, and died of a stroke. He can be heard on a number of studio recordings and archived broadcasts. When thinking of great singers, those who perform the leading roles immediately come to mind. This is, of course, a natural reaction, and generally is correct. However, there are a few who work night in and night out in the smaller roles that must also be given the sobriquet of "great" and one such is Florindo Andreolli. His short physical stature denied him the star's spotlight, but like the few famous jockeys, he made his roles special, and in the course of doing so, his career was truly a great one. Much of this appeared in my magazine Opera Scene in December, 1982. This website now shows the entire encounter, re-edited and with the inclusion of biographical material and that full list of his Chicago performances. My thanks to Marina Vecci of Lyric Opera of Chicago for providing the translation for us both during our meeting. Bruce Duffie: Tell me about how you got started singing comprimario roles. Florindo Andreolli: When I was studying voice at the conservatory in Venice with a great teacher, Gilda Dalla Rizza, she used to say to me that the only problem she saw as far as my career was concerned was that I was too short. Soon after graduation, thinking that I would not be able to have a tenor's career, I went on studying so that I could teach voice. My first teacher was Rosetta Pampanini, and then I worked with Tito Schipa. I made my debut in Palermo as Paolino in Il Matrimonio Segreto by Cimarosa. Then I had two years when I did not work since I was not suitable because of my height for the roles that were to be sung. But I was happier on the stage than teaching voice, so I started accepting roles like Pong in Turandot, Arlecchino in Pagliacci, a beautiful role in Il campiello by Wolf-Ferrari, Goro in Butterfly, the four characters in Tales of Hoffmann, Nick in Fanciulla del West, and some roles in Russian operas like the Scribe in Khovanshchina, also David in Meistersinger, and roles in many other operas. BD: It seems like your range of roles is much bigger than that of a leading tenor. FA: Yes, and I am really committed to these roles very much. I left behind the idea of becoming a first tenor a long time ago. I am considered by the media the best Bardolfo in Falstaff in the world. Of course, this role demands a small person, but he has to have a very beautiful voice even just to do a couple of lines. When I do a small role, I am committed and take it very seriously - as if it were a very large role. It doesn't matter if a role is big or small; one has to be always ready and in good shape vocally. For example, even if I have only two words to sing, if I sing them badly the entire performance suffers somewhat. But if I sing those two words strongly and in character, it becomes part of the overall level of the performance, and the public accepts and enjoys it. I have always been of the opinion that I must be in as fine shape physically and vocally to do a small role as a large one. I never look down on the role of the comprimario tenor. BD: Of course! It's a part of the performance that must be upheld. Do you find that in a few of these roles - Bardolfo or Valzacchi, for example - your short stature is beneficial to the overall effect? FA: Yes, of course. In many of the roles I do, height is important. BD: Are some of the opera houses demanding your services too much? FA: Yes, I have many, many requests. BD: In a repertory house, you get to work almost every night. Do you enjoy working that often? FA: Yes! As far as I am concerned, I would like to sing all day long! I have no vocal problems. I love the stage and the theater. When I see a colleague who sings with desire and enthusiasm, I am taken with that drive myself even more. BD: So if the leading singers are better, you are better? FA: Certainly. Those who love singing always improve the performance. Just a few days ago, when Eva Marton was singing Tosca, I could see goose-bumps on her arms, and for me it was a thrill. On the other hand, when the soprano or tenor are just half-singing, then you lose enthusiasm in what your are doing yourself. BD: Do you enjoy singing in many languages? FA: I enjoy singing in many languages although I may not be perfect in them. I sing in French, German, Russian, and of course Italian. FA: No, it's too difficult for me. BD: Do you enjoy singing opera in translation? FA: I've sung Khovanshchina in Italian in Rome, but I like it better in the original language. The same is true for Boris, which I've sung in Italian but I enjoy it more in Russian. FA: I feel that it's a challenge to me to perform the role in such a way as to make the part understood by the public, and to communicate the feelings of the character in the original language. It is very important for the singer to interpret it right so that the public understands even if it's not in their own language. BD: Let me ask you about productions. Do you agree with all the extra business being demanded today by the stage directors? FA: Not always. For instance, I did Love for Three Oranges in Florence with the same man who directed it here in Chicago [Giulio Chazalettes], and he wanted me to do acrobatics on the stage. He gave me no peace until I was able to do all the jumps and the gymnastics! I was not very happy about that. I'm not always in agreement with the stage director, but I must follow his ideas as best I can. BD: Do you ever get to the point where you refuse to do something? FA: Yes. That happened here in Chicago with Mr. Puecher in Tales of Hoffmann. He demanded too much of me and wasn't clear what he wanted of me. I kept asking him to be clearer in his instruction because I couldn't understand what he wanted. But on the whole I've never left the stage in a huff. I tend always to be in agreement with the stage director. BD: Do you enjoy it when the stage director asks more from you and expands the role to have you onstage longer? BD: Most of the operas we've talked about have been Romantic or Verismo works. Do you also sing in 20th Century operas? FA: Oh yes. I've sung operas by Petrassi and a lot of contemporary music. BD: Do you enjoy these new works? FA: Yes. When it's good music, I like it regardless of the period. Unfortunately, sometimes you find things that are really badly done. As singers we have to interpret whatever is given to us, so we have to make the best of it. BD: Do the new composers understand how to write well for the voice? FA: It is true that some composers, when writing music, do not think of the person who has to sing it, and ignores the vocal difficulties that a singer can meet in doing the role. BD: Should the composers be more careful about this? FA: The composer should take into consideration the voice range. Sometimes in modern music you find absurd ranges which the singer must reach. I've seen things written for tenor which dip down to the baritone G, and this is very difficult for the tenor to sing. There is no point in writing outside the extremes - or even writing close to these edges of the range which cannot be handled easily or at all! BD: Is opera becoming more theatrical today? FA: There are a lot more people going to the theater today in comparison to fifteen years ago. This is not only in America but also throughout the world. BD: Is this partly due to the plethora of recordings? FA: Recordings are certainly a cause of more people going to the theater. But I also feel that people are better prepared today to have a greater interest in the arts than they had fifteen years ago. For instance, a few years ago there were not as many student performances which you have today. That certainly contributes to building an audience for the future. Nowadays, also, music is obligatory in school, so you can learn who Verdi is and hear how he sounds. Today the public is more prepared than it used to be, and there are many more possibilities today to see opera. You used to have to take the train to get to La Scala, but today a car makes it much more accessible. So education and progress in general has made people more interested in theater. BD: Does television help this, also? FA: I think that television is certainly a very great help in the appreciation of opera. BD: Does opera work on the small screen? FA: Certainly because you have the theater in your own home. [At this point, Sig. Andreolli becomes like a wide-eyed child who is discovering for the first time the various aspects and characters that make up a performance.] "Who is that? Oh, that is the soprano. And there is the tenor, and over there is the conductor. That must be the chorus. So this is the opera!" BD: But do people get the wrong impression if they only see it on the small screen? Are they really getting the impact of the theater, or are they going to be disappointed when the come to the opera house? FA: I think that when they finally come, they are prepared. All of this is preparation for what you get in the theater. Remember, a large segment of the public has never seen an opera at all, so the television has exposed more people to opera who would never have had any impression of it whatsoever. BD: I've asked you about new operas. What about old ones by Monteverdi or Cavalli. Is there a place in the repertoire today for these works? FA: Definitely there is a place on the stage for early opera. I have sung some Cavalli with I Virtuosi di Roma. We toured all over the world works of Paisiello, Galuppi, Cavalli, etc. BD: Would you ever sing Il Maestro di Capella if it were arranged for tenor? FA: This is the first time I've heard this suggested... but why not? Perhaps it would be interesting to transpose it upward. The only question would be whether or not the character would be suitable to be interpreted by a tenor. But it certainly is an interesting idea. I'll give it some thought. [Smiles] You know, when we toured with Maestro Fasano, we very often did this work with Sesto Bruscantini. We took it to Russia, Japan, New York, all over. BD: Would you ever do just an acting role where there was no singing at all? FA: I've done Vespone in La Serva Padrone which is a silent role. The character does all the comic action and is always onstage. BD: As a singer, does that frustrate you at all? FA: It wasn't frustrating because I had a great success in it. I was really brilliant in that role, even without singing! Of course I really love the piece, but I must say there is much more satisfaction when I can act and show my vocal quality to the public. BD: Do you also sing recitals? FA: In the last recital I did, I sang well-known famous tenor arias from Mefistofele, Werther, Fanciulla del West, as well as a duet from L'Amico Fritz and some Neopolitan songs. BD: That's just a standard recital. Is the audience surprised to find a comprimario singer doing these arias? FA: Here in Chicago I met a lot of people who told me after seeing me in Hoffmann that I really have a voice and can really sing! Last night there was an agent from Columbia Artists and he said I was a real tenor! He was surprised to hear my voice which is very big and mature. As I've said before, many of the roles I sing are comprimario roles but they require a big voice. You cannot sing these parts without having a big voice. BD: Perhaps the agent can find you a very short soprano and send the two of you out on tour! FA: I feel quite large when standing next to Ruth Welting - like a big brother! BD: This reminds me of another very short tenor - Joseph Schmidt, who spent most of his career on radio. FA: The director of the Rome Radio suggested the same thing to my voice teacher, but at that time what was paid to radio singers wasn't enough to make a living. I've sung a lot on the radio, but it wouldn't have ever been enough to rely on that alone to live. So as soon as I realized that there was no hope to make a career in leading tenor roles, I changed and went into the comprimario roles. BD: OK, then how do you select which of these many roles you will sing? FA: First I read the score, then I go to the piano, and then I decide whether to do it or not. For instance, I turned down a role recently for La Scala because it has a lot of recitatives in French and required a long time to study. I did not have the time to study it properly, plus it had a lot of very low notes and was not very comfortable for me to do. I did not feel that I should step on the stage at La Scala in something that I'm not comfortable with. One should have the courage not to do certain roles. BD: That's one of my favorite questions - how difficult is it for a singer to say no? FA: It is a very hard thing to have to say no, but a truly responsible singer understands immediately when he must say no. BD: You've been watching and listening to singing for over 30 years. How has it changed in that time? FA: I think we have watched it change for the better because there is more study and more preparation today. But singers' careers last less today due to the possibility of getting so rapidly from one place to another. You have a lot of singers whose careers last maybe five or six years. You hear a lot about them and then they disappear. BD: So they're singing too much? FA: Yes. Gigli and Schipa sang for a very long time, but when they went from Italy to, say, Buenos Aires, the trip would take a month, so they had time to rest their voices. It was not like today when you burn yourself out in a short time. I know of one very famous tenor who was recording during the daytime and performing the same evenings at La Scala. BD: Perhaps he could do it for awhile, but it will undoubtedly shorten his career. FA: Opera is going better today because of many things together - better preparation on the part of the artists and also better technical facilities which make things easier on the stage, so that the public enjoys opera more. BD: So you are optimistic about the future of opera? FA: Absolutely. Since the war, I've seen a greater and greater enthusiasm for what opera is about, and it's gotten better and better. Opera is just like the dollar - it's always going up! BD: How much warm-up do you do before going out on the stage? FA: I am very lucky in that I never need any warm-up per se. I'm always ready to go out and sing. However, every singer, while making up to go onstage, sings a few scales and arpeggios, and tries out the voice even by simply saying "hello" or "good luck" to fellow artists. Every singer is constantly thinking about the performance, and so is using the voice in such a way as to warm it up even tough we don't always vocalize very much. BD: Are there occasions where you've helped others out by giving them words or pushing them in the right direction on the stage? FA: Certainly, many times. Sometimes I've pointed out that a shirt is coming undone, or things like that. Here in Hoffmann, by mistake I picked up a handkerchief that I was supposed to leave onstage. He whispered to me about it, so I very casually dropped it where it was supposed to be. Everyone helps everyone else all the time on the stage. BD: How does the opera house here compare with others in the world? BD: Thank you for being such a fine singer in these very special roles, and for giving Chicago so much of your time. FA: It has been my pleasure, signor. Ha iniziato lo studio del canto sotto la guida di Rosetta Pampanini, proseguendolo in seguito con Gilda Dalla Rizza al Conservatorio di Musica "Benedetto Marcello" di Venezia, dove si è diplomato il 30 giugno 1953. Si è esibito per la prima volta in pubblico il 6 giugno 1948 nel corso di un concerto al Teatro "Ferrini" di Adria, cantando brani da’ L’ARLESIANA, FEDORA e MARTA. Nel ’50 ha vinto il Concorso "Voci nuove per la Lirica" indetto dall’E. N. A. L, e nel gennaio del ‘51, quindi ancora studente, ha debuttato al Teatro "La Fenice" di Venezia con GIANNI SCHICCHI, nel ruolo di Gherardo. Con LA CAMBIALE DI MATRIMONIO alla Rai di Milano, dava inizio nel febbraio del ’53 alla sua collaborazione con l’ente radiofonico italiano, collaborazione che si è protratta fino al 1977 e che vede la sua presenza in 42 opere, diverse delle quali - IL CAPPELLO DI PAGLIA DI FIRENZE, IL TURCO IN ITALIA, MEDICO SUO MALGRADO, ANDREA CHÉNIER e LE CAMPANE – realizzate anche in versione video. Sempre nel ’53, in dicembre, debutta con Il MATRIMONIO SEGRETO al Teatro Massimo di Palermo, proseguendo quindi la sua attività nei principali Teatri italiani (Verdi di Trieste, Regio di Parma, alla Scala di Milano, Regio di Torino, Opera di Roma) e con le prime uscite all’estero, fra le quali bisogna ricordare le 10 recite de’ L’ELISIR D’AMORE a Tel Aviv con l’Orchestra Filarmonica d’Israele sotto la bacchetta di Ettore Gracis, e il debutto al Grand Théâtre di Lione con PAGLIACCI diretti dell’adriese Nello Santi. In occasione del 18° Maggio Musicale Fiorentino (1955), debutta – con la versione scenica di ANTICHE ISCRIZIONI di L. Rocca - al Teatro Comunale di Firenze, il Teatro italiano con il quale Andreolli ha collaborato più a lungo: vi canterà infatti quasi ininterrottamente fino al febbraio del ’93, in un repertorio di 17 opere per un totale di 98 rappresentazioni. Nell’ottobre del ’56, a Napoli, inizia l’attività discografica con l’incisione de’ IL FILOSOFO DI CAMPAGNA (diretto da Renato Fasano, per la EMI), proseguendola poi fino al 1987 con LA FANCIULLA DEL WEST (Trin) (diretta da Lovro von Matacic con i complessi del Teatro alla Scala, sempre per la EMI), LO SPEZIALE (diretto da Ferdinando Guarnieri con i complessi del Teatro di Villa Olmo, per la Cetra), OTELLO (Cassio) (diretto da Tullio Serafin con i complessi del Teatro dell’Opera di Roma, per la RCA), ancora OTELLO (Roderigo) (diretto da John Barbirolli, per la EMI), LA FORZA DEL DESTINO (Mastro Trabuco) (diretta da Lamberto Gardelli, per la EMI), GIANNI SCHICCHI (diretto da LORIN MAAZEL, per la Cbs-Sony), ADRIANA LECOUVREUR (L’abate di Chazeuil) (diretta da James Levine, per la Cbs-Sony), MADAMA BUTTERFLY (Goro) (diretta da Lorin Maazel, per la Cbs-Sony), PAGLIACCI (Beppe) (diretti da Georges Prêtre con i complessi del Teatro alla Scala, in versione audio e video per la Philips), ANDREA CHÉNIER (L’abate e Un incredibile) (diretto da Riccardo Chailly, per la Decca), FRANCESCA DA RIMINI (Ser Toldo Berardengo) (diretta da Maurizio Arena, per la RCA). (A questa discografia effettuata in studio, è da aggiungersi quella dal vivo ricavata da registrazioni teatrali. Per il catalogo e l’aggiornamento di quest’ultima ci si può rivolgere al curatore delle notizie). Dopo essersi affermato nei principali centri musicali europei (a Londra e a Parigi dal ’60, ad Aix-en-Provence e a Lisbona dal ’64, a Ginevra dal ’65) e sudamericani (Teatro Colon dal ’67), Andreolli si presenta nel giugno del ’68 al Metropolitan di New York, e nell’ottobre dello stesso anno al Civic Opera House di Chicago, Teatro nel quale ritornerà poi ininterrottamente fino al 1990 in un repertorio di 20 opere, per un totale di 285 rappresentazioni. Con TURANDOT, nel luglio del ’75, Andreolli debutta all’Arena di Verona, ritornandovi poi fino al ’91 con BORIS GODUNOV, uno dei capisaldi del suo repertorio, LA FORZA DEL DESTINO, TURANDOT (portata con i complessi dell’Arena anche a Tokio), CARMEN e LA FANCIULLA DEL WEST. L’altro centro musicale italiano, con attività estiva, molto frequentato da Andreolli fu il "Festival pucciniano" di Torre del Lago dove, dal ’79 al ‘91, ha cantato in TOSCA (sotto la bacchetta dell’allora emergente Giuseppe Sinopoli), MANON LESCAUT, LA FANCIULLA DEL WEST, LA BOHÈME, IL TABARRO e TURANDOT. Artista versatilissimo, Andreolli aveva un repertorio comprendente 121 melodrammi di 61 autori - da Monteverdi a Henze - cantati in italiano, francese, russo e tedesco, per un totale di 152 personaggi, tenendo conto che in diverse opere interpretava più di un personaggio: ad esempio ne’ I RACCONTI DI HOFMANN ne interpretava 4, ne’ L’ULTIMO SELVAGGIO ne interpretava 3, così pure nella MANON LESCAUT e in PARIDE. A quello operistico è da affiancare il repertorio oratoriale - con LA PASSIONE di G. F. Malipiero (dove interpretava 3 personaggi) e IL SEDECIA RE DI GERUSALEMME di A. Scarlatti – e quello sinfonico-vocale, con i CARMINA BURANA di K. Orff. Dopo 5 rappresentazioni di BORIS GODUNOV - nel prediletto ruolo di Misail - al Teatro Regio di Parma nel gennaio del ’94, Andreolli si era concesso un periodo di meritato riposo prima di riprendere l’attività, ma l’ictus cerebrale che lo colpì nella natia Bellombra il 18 aprile 1995, non gli permise di ritornare ancora sul palcoscenico. This interview was recorded in a dressing room backstage at Lyric Opera on October 27, 1982. It was transcribed and much of it was published in Opera Scene Magazine in December of that year. The transcription was re-edited, the photo was added along with the biographical material in the boxes, and it was posted on this website in 2013.